Setting up the Arsenal is tricky. Model railroad photography is a unique branch of photography. If you take a conventional professional photographer and ask them to shoot a layout, they probably won't get great results. They will get well focused and exposed shots, but they probably won't look real. 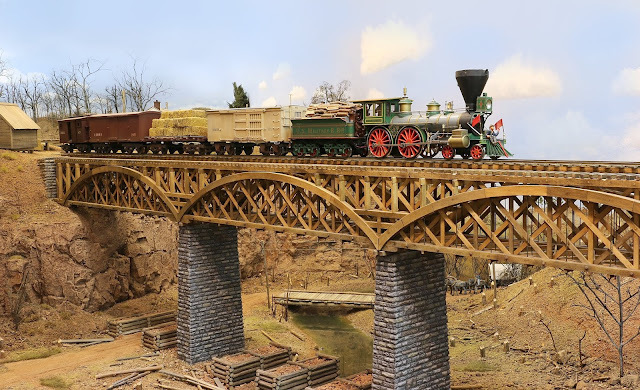 It takes some experience to learn the tricks on how to make model trains images look real. Why? We are trying to take macro range images of our models and make them look like natural images taken outdoors where everything is in the hyperlocal region. I discussed this before here. The use of focus stacking software has changed how we achieve that objective. Instead of using one image where we hope everything is in focus due to a tiny aperture, we use multiple images where only a small sliver of the image is in focus. We then use image processing on a computer to create one sharp image from the set of in-focus slivers. The process of taking the slivers can be tricky as you must manually move the camera focus in a step-wise fashion to get complete coverage of the scene. If you go too far on any individual step, you may leave a portion of the image that is out of focus. This is made more difficult if you use a wide aperture for each sliver, as each sliver with have a smaller section in focus. In using focus stacking, I find I get the best results with apertures around f9-f16 and 6-10 images. It depends on the scene. Photos that will have a lot of immediate foreground need more images, as the foreground slivers are narrower than the slivers in the background. Arsenal is processing the stack of images. When I learned about the Arsenal intelligent assistant about two years ago, it sounded interesting. The automated focus stacking especially caught my attention. So I was an early Kickstarter adopter. The device arrived this week, and I did a series of test shots. I followed the directions and let the device charge over night. Meanwhile I downloaded the Arsenal Ap to my phone.This Ap will control the Arsenal device, which I mounted on the Canon 70D camera. Once everything was mounted up I installed the latest firmware updates and got the Ap to connect to the camera. The Ap creates its own WiFi network. The connecting process was finicky. It took me several tries to connect the device to the phone. It appears that the USB plug is very susceptible to improper connection. Once I got it connected, I only lost connection once in a two hour photo shoot. I shot a series of images using the focus stacking feature. The Arsenal does a pretty good job of advancing the focus to get the slivers. However, it seemed like the Arsenal had real trouble in taking up close slivers using my Macro lens. So I switched to my 18-135 zoom and it worked better. As the Arsenal makes the camera take an image, that image is written to the SD card on board the camera. Once all the images of the stack are taken, it loads them to the Arsenal Ap via WiFi. But it does not load the full res images to the phone. So once you end the session, the high res images are erased from the Ap. However, they are still on the SD card in the camera. Then the Arsenal tries to create a single image from the stack of images. This process takes anywhere from 5-20 minutes. In some of my test cases, it never finished processing and I did not get a finished image. When I did get a finished image, I saved it using the share button on the Ap. I saved mine to the phone, but you can email or send to social media. The Ap stops processing if the connection to the camera is broken. That is annoying. I'm not sure if it picks up again when you reconnect. I don't think it does. In general, the processed images from the Arsenal where not usable. Below you can see three of the results from about 13 test images. The stacking processor in the Arsenal is not as good a Photoshop or Helicon Focus. It's slow and doesn't always give a fully sharp image. Sometimes the processor hangs up and never gives a final image. That's the bad news. The good news is that the stack of images are on the SD card. So I imported them to my computer and used Photoshop to get the final stacked image (see lead image above). That image looks fine. My initial reaction to this device is mixed. The wireless connection was finicky to set up and will cut out if you make any camera changes or jiggle the USB cord. The device does a good job of taking the images for the focus stack, but the on-board processor was not able to consistently create a final image. If you have a recent version of Photoshop or Helicon Focus you can use the stack that the Arsenal generates to get a good image, but you won't be able to rely on the on-board processor to handle it for you. I'll do some more tests and report the results in the future. The Arsenal is capable of other features like HDR and time lapse, but I did not test them. I did not take the device outdoors, so I can't comment on how it works in that environment. able to make a nice sharp image from this test. I tried this with 10 images and the processor got hung up. But with 6 images the Arsenal was able to process the stack. Last week was the latest road trip - a solo drive to the ChicagoLand RPM meet in Lisle, IL via Lexington, KY. It was a whirlwind trip. The first stop in Kentucky was to see my son, Chase, and his girl friend, Mizuki. I arrived in Lexington after about 10 hours of driving. The next day Chase and I played golf at the UK Wildcat course. UK has two nice golf courses. MIT didn't have any as far as I know. While we golfed, we heard several trains go by. Lexington is a busy railroad town, as well as being a charming small city. The bluegrass country is beautiful and the weather was crisp and sunny. The next day I drove up to Naperville to check into my hotel. I did not stay at the RPM hotel, as it was booked by the time I remembered to make a reservation. (Note to self, try to remember to book early next time). I got to the meet at about 6:00PM on Thursday. Most everyone was at a banquet or at dinner. So I set up some of my models for display and went to my assigned clinic room to get ready for my talk. I presented two iterations of my clinic, "A High Tech Approach to a 19th Century Layout." These versions were slightly longer than the clinic I presented at the NER Regional Convention last month. This means that in the past 3 months I have presented this clinic 5 times, as well as two other clinics, at 4 different conventions. I also attended some interesting clinics at the Chicagoland RPM. Of great interest to me was George A. Bogatiuk's update on the Tsunami 2 decoders. I think he convinced me to standardized all my decoders on Tsunami 2. I already have them in my steam engines, but some of my diesels have LokSound decoders. I have no way to program those decoders as SPROGs and Decoder Pro can only do the basic functions. LokSound requires a special programmer that costs about $200. Instead I think I would apply that cost to a NCE DCC system with a Proto throttle for my HO layout. I wouldn't change my steam layout, as that uses EasyDCC. The Proto Throttle doesn't work with EasyDCC- yet. Plus, the NCE throttle makes Ops Mode programming easier on the HO layout. That is because my EasyDCC control panel, which is how I do ops model programming, is near Potomac Station under the O scale layout in the front room. This making programming changes and testing the effects on the HO track inconvenient. The NCE dog bone controller has ability to ops mode built into the hand unit, so I could do ops model programming while standing next to PoLA. One of the lessons I took away from George's talk was the proper use of independent brake and automatic brake, though I think the latter would be better called "train air brakes." With proper programming, you can use the Tsunami2's to accurately portray train brake operation. Combine that with a Proto Throttle and you have a realistic and fun simulation of diesel locomotive operation, though I am not sure how the Proto Throttle handles independent versus air brakes. My Aquia Line Easy DCC and Stanton throttles already do a pretty good job of steam engine simulation, so most of this new info would apply to PoLA. Of course, if I get rid of PoLA, then this is moot. I went to other clinics too. Steve Hile presented an interesting talk on the Decorah Branch in Iowa. Those granger branches do have a charm of their own. They seem exotic to an east coaster like myself. Keith Kohlman discussed the operations and presented a bunch of neat photos of the Erie Bucyrus plant in Milwaukee. It is a very modelgenic facility and he is doing some nice work in modeling loads from the plant in N Scale. Kristen Dummler discussed the history and modeling challenges of early live poultry shipping cars. She is building an assortment of models in HO scale. These could be a possible kit for Alkem Scale Models as they might benefit from some etched parts. Of course the camaraderie at the meet and over meals was great too. I had lunch with Hal Miller and Cody Grivo, and went to dinner with some of my friends, Jack Ozanich, Craig Wilson, Alan Bell, from the Michigan area. Along with Bill Neale, we decided to try to set up a ops weekend in the Washington DC area in Spring. I also met a lot of new people. It was the first time I met Pierre Oliver of Yarmouth Models and saw some of the fantastic work he is doing. It was very impressive. He told me of his plans to build a SP branch line railroad based on a location in California. Got to love those branch line layouts. I also met Jeremy and Kristen Dummler for the first time even though we have emailed each other in the past. They are a husband wife team that do modeling railroading together. That is so cool. This was also my first time meeting Keith Kohlman, Paul Strubeck, and Cameron Tester, even though we have corresponded in the past. Shout out to Mike Skibbe, Matt Gaudynski, and crew for doing a great job organizing and running the meet. Alas, I didn't get to visit any layouts or hobby shops. Next time, I'll have to allocate more days to the meet. I returned home on Saturday, doing the drive in one day in 11 hours and 59 minutes. My family went to the 1964 NY World's Fair several times. I was about 8 years old at the time, yet I vividly remember several of the exhibits. The Ford exhibit was cool as you rode in a convertible car to see the displays. But my favorite was the GM exhibit. I recently found this promotional video describing the GM exhibit at the 1964 NY Worlds Fair. The visitors rode in seats on a conveyor belt that travelled through a series of large-scale miniature dioramas. The scene I remember being most impressed by was the laser logging operation. It was so cool to see it again in this video, much like I remembered it. I think this exhibit, and the dioramas at the NY Museum of Natural History, were largely responsible for my interest in miniature dioramas. My interest in trains came much later. I posted a brief video explaining some tips on how to operate the link and pin couplers, waybills, working brakes and battery powered locos on my youtube channel. This may help you if you come to operate the Aquia Line. I’m heading to the Naperville RPM tomorrow to show the flag for the Aquia Line and MARPM. I will be doing two talks on the Aquia Line. If you are there, please stop by to say hello. After a five month break, the Aquia Line and PoLA hosted op sessions today. This was the 16th session for Aquia Line and the first with fully functional front links. It was also the 21st Official Session for PoLA. The sessions ran very well, despite the crews being a little rusty due to the long break. On PoLA, Brad Trencamp was the conductor and Lance Mindheim was engineer. The Aquia Line ran with two crews. Train 7 had a three-man crew with conductor John Barry, Engineer John Drye, and brakeman Tom Pierpoint. Train 8 had a two-man crew of conductor Doug Gurin and engineer Shawn Fenn. Later Brad Trencamp replaced Doug and was the engineer. Both Lance and Shawn were first time operators on the layouts. Overall, the sessions went went, despite some ominous activity the night before. One of the turnouts on PoLA broke while I was cleaning track. I was able to fix it quick enough. Then, when I turned on the DCC system, the Aquia Line was fine but PoLA wouldn't respond, despite getting power. I rebooted everything and that solved the issue. Wait for it, .... yes, I HATE DCC! Fortunately, the DCC system worked without mishap on Sunday during the sessions. A lesson we need to reinforce, Aquia Line crews must insure that the turnout levers are locked in place, as most of the trouble they had today occurred when stub switches were not fully locked into position. This was the first op session where the Aquia Line crews could use the front links. They used them to good effect. They greatly increased their flexibility to switch the sidings. They even came up with some innovate ways to tag team switching at Brooke, as you can see in the video below. Great session guys. Thanks for coming. It's been a whirlwind couple of weeks. Hopefully, I can take a breather next week, before I head to Chicago for the Naperville RPM. Last week Alicia and I went to Minnesota to help my mother in law with some chores, attend Alicia's college reunion, visit relatives, and do some rail fanning. We got to see my brother-in-law's machine shop where he is building a Mustang II hot rod with a 427 (actually a restroked 351 V8). Kevin and Alicia with the "famous" brian stimulation violin. We also got a tour of a biomedical lab at the Mayo Clinic that is run by my fraternity brother Kevin Bennet. They are doing amazing work in neurosurgery. Talk about cool tools, they have a complete machine shop with just about every tool you could want and then some. How about a femtolaser, a laser which emits optical pulses with a duration in the domain of femtoseconds (1 fs = 10−15 s). They use it to make tiny electrodes for deep brain stimulation. They also developed a machine that makes synthetic diamonds for use in brain stimulation electrodes. Wow! Earlier in the trip I got to spend a day visiting layouts in the Mason City, Iowa area and doing some rail fanning. After driving through seemingly endless corn fields, I arrived at Clark Propst's M&StL Branch line layout first. This layout was featured in MRP 2018. He put me to work as a conductor for an op session, while he was the engineer on a nice little mogul. It was very enjoyable session. I think layouts like this a perfect for a medium sized space. The layout is composed of three towns with lots of switching at each, yet spaced out enough to feel a sense of distance between towns. The scenery and structures are well done. After lunch we visited Bob Gretillat’s Rock Island RR. It's a large double deck railroad designed for operations. We didn't operate it, but did get a good look. Bob Drenth met us there. His house was the next destination. He has two railroads, a large ride-on outdoor railroad and a indoor HO layout. We had a great time riding the large scale trains, such that we just had time for a peek at the indoor railroad before I needed to head back. But the train action continued as I swung by Manly Terminal to watch wind mill parts being unloaded, and caught a short train in Lyle, IA with a few covered hoppers. I made a video of the highlights of the trip. I apologize for misspelling some of the names in the video, I tried to correct them above. When I wuz a kid, i cudent even spel enjunear, now I are one. Once home, I hosted an open house for the MER NMRA and presented a clinic with an update on the Aquia Line. It's hard to believe, but the Aquia Line is coming up on its 10th year anniversary.